ALBANY, GA – A Coffee County pastor and former Christian school headmaster is in jail charged with child molestation. Car after car filed into the school's parking lot Tuesday night. Parents were called in to meet with school and church leaders about the child molestation charges filed against a man they trusted with their children. "We've got people with a lot of questions. We've got families out there who are hurting that are involved in this and a church that is involved in this," said current FCA headmaster and interim First Community Church Pastor Ben Warren. 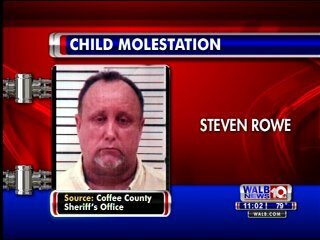 Less than a mile away from the church and school he helped establish nearly a decade ago, Rowe sits in the Coffee County Jail charged with 4 counts of child molestation and 2 counts of aggravated child molestation. Warren, who took over headmaster duties three weeks ago, says the news of Rowe's arrest has shocked the entire community. "I'm standing here tonight in a state of shock. I would have never figured this. And if you ask around the community here you'll find that no one ever really thought this," said Warren. He says Rowe has not been affiliated with the church in more than a year and was teaching in Brunswick at the time of his arrest.